When I started the blog, I was writing and posting almost every day. That was partly because my hours at work made it easier to do so, but also because the resources I used in researching my posts were limited - a few books and a small number of web sites. In fact in the first few months, I could publish while traveling by simply taking everything with me! As time went on, I discovered more and more books, more web sites, and more people to consult with about any topic I was researching (many of them readers of this site - thanks!) And eventually, I discovered how to use the National Library at Hebrew University (which now is pretty close to where I work). And as a perfectionist (if not a particularly effective one), I'm rarely satisfied posting anything unless I've researched it as much as I feel I can. So naturally, that makes more work in writing a post. Additionally, I've become less satisfied with my earlier posts, where I simply shared a few interesting etymologies. I still do that sometimes, but I prefer to write about a topic where I've discovered something new. I think I've done that with some of my more recent posts, and it's a lot more fun. But again - a lot more work. Add that to more pressure for time at work and home, and you can see why my posting has become more erratic, to say the least. But I haven't given up on Balashon, nor do I plan to. 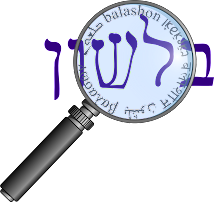 Actually, since my last post in January, I started working on one of the most interesting and complicated posts I had ever done - the origin and meaning of the phrases "mazal tov" and "b'shaa tova". Dozens of sources, and some really interesting revelations. But I need some serious free time to start putting it all together. And then the new project came. What new project? Last December I noticed something that I had never paid attention to before: why does the Torah not explain the reason that Avraham (Abraham) was chosen by God? I started looking in to the question just as a curiosity in the beginning, with no idea what this would lead me to. As it happens, this question affects almost every aspect of Jewish philosophy. Now this has turned into a huge project, which I hope will end up published at the end - perhaps even as a book. Interestingly, this quest has connections to Balashon as well: both to my yet unwritten "mazal tov" post, and about the significance of the Hebrew language in general (something I'm often asked by readers). I do hope to go back to writing posts on Balashon before I'm done with the Avraham question, but I can't promise when that will be. I do still have all of your emails and comments, and still have my index file with almost 2000 words and the sources that discuss them. But please be patient. One more note - my old comment system is closing down in October, and you all have written great comments over the years. After trying to import the comments in bulk to the new system (which you currently see on the site), I've determined that to keep them I'll need to copy them manually. This is a tedious process, and is using any of my "Balashon" time that I had at all. Again, thank you all for continuing to follow the blog - and I hope to be writing again soon!